We know you brush your hair and teeth every day, but did you know brushing your skin is equally, if not more important. SB, actually helps stimulate your lymphatic system aiding in overall detoxification in the body. This practice has been gaining quite a bit of hype recently with spas and wellness programs but has been around since ancient history. The Greeks, Japanese and Native American Indians used this practice to keep their bodies healthy. Dry brushing is exactly what it sounds like. You start off by brushing your skin in a particular- pattern towards the heart just before showering. You will want to use gentle pressure while brushing so that your skin appears pink after and not RED. The best type of brush to use is a firm natural bristled brush with a long handle and it should be done 1-2 times a day for optimal results. It’s important to be able to reach your back as well as brushing the backs of your legs and bottoms of your feet thoroughly. I have a set of brushes, which is my favorite to work with as it includes a face brush and two body brushes, each with a different firmness. Although, many of us aesthetically want our skin to feel and look beautiful on the outside, there are key benefits of SB that go beyond skin deep and offer complete whole-body health benefits. Skin Brushing stimulates your lymphatic system- which is responsible for eliminating cellular waste products. Exfoliation-dry skin brushing removes dead dry skin and build-up of keratin with Keratosis Pilaris, which improves clogged pores and gets rid of most if not all the bumps. Consistency is key here. Increases Circulation-which helps the elimination of metabolic waste. Stress Relief- this practice is meditative, especially if you do it in a quiet place. Natural energy boost- one theory is that it increases circulation, which can also increase energy. It simply feels so good that people report feeling invigorated after a quick session. 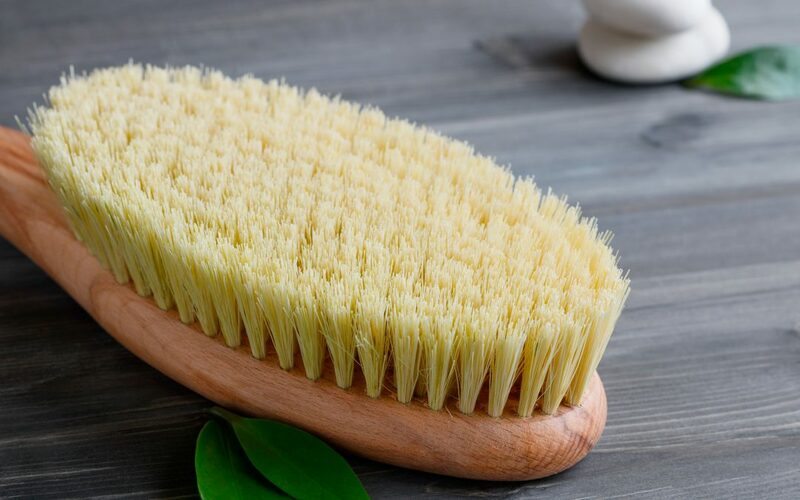 Skin Brushing helps improve digestion and kidney function. Note: If you have Keratosis Pilaris or bumpy arms brush in circular motion on tops and bottoms of arms for five minutes then repeat on other arm) This really works but you must do daily for this condition. Then move to the back and then face but use a more delicate brush if you have more than one brush. Otherwise, go lightly on these areas. I recommend finding what works best for you and create a daily ritual out of it. Eating a healthy diet is crucial and eating lots of greens will also help promote beautiful and clear skin. Apres skin brushing, I recommend using and olive oil bar to wash off in the shower and after showering use pure unrefined- raw coconut or almond oil all over your body. Your done!